Roger Hanson surveys his ice sculpture, which he's rebuilt after a collapse last week. Hanson's original sculpture stood 66 feet high. Its color comes from the tannic acid in Lake Superior's waters. Frequent spurts of water from Hanson's spray tower form icicles on cold days - ideally no warmer than 20 degrees with light winds. Hanson brushes the unwanted ice forming on a flood light. Hanson lives onsite in a trailer, where he can monitor his sculpture 24/7. He measures temperature, water pressure, and seismic activity. Nightfall often brings the best conditions for ice building, so Hanson sleeps little, waking himself every hour to check and adjust the system. Surrounded by icy debris from the fallen sculpture, Hanson is slowly rebuilding it. 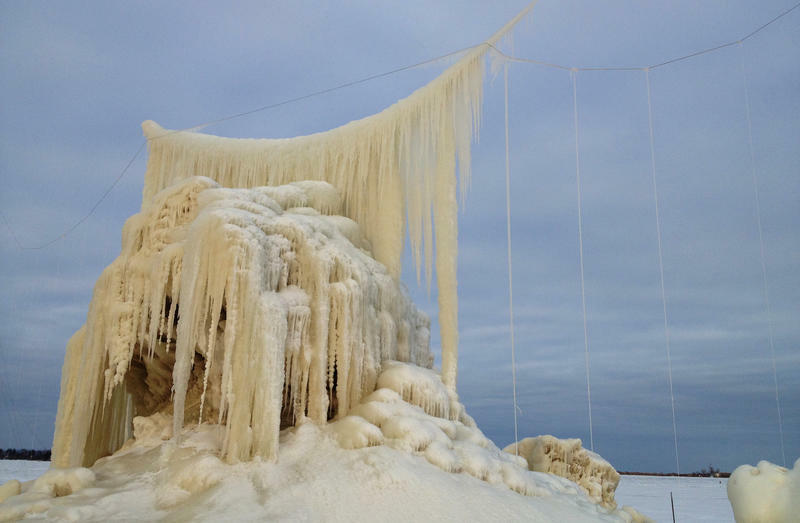 On the edge of Lake Superior, a 60-foot tower of man-made ice came tumbling down last week. The ice sculpture was part of a public art project commissioned by the city of Superior, Wis., and the man behind the unusual sculpture is determined to make it rise again. Two weeks ago, the ragged pillar of ice towered above Barker's Island. You could see it from the road driving into Superior. "I think it's pretty impressive," says resident Alya Pfeil. "At first I thought it was just frozen ice, nothing to it. But it's actually quite impressive." Mother Nature has again put an end to the Eagle River Ice Castle. The Ice Castle is constructed each year by the Eagle River Fire Department. They take 3000 blocks of ice from Silver Lake and construct the attraction in downtown Eagle River.